In 1877 his classmates had begun to call him "Lucky Marden!" In that year he began to win honors at college, as well as to distinguish himself as a successful hotel manager. "In 1877 I engaged to work as second assistant clerk in the front office of the Ocean View Hotel, Block Island, Rhode Island, for which I was to receive the sum of one hundred and eighty dollars. Promotion rapidly followed promotion until, near the close of that season, I was made manager. I managed this house for quite a long time. It was improved and enlarged until, with its cottages and the former home of its proprietor, it accommodated, when crowded to the somewhat sardine-like capacity of hotels in those days, nearly six hundred guests." "The hotel gained quite a reputation as a first-class house, where a great many noted people spent their summers." "This gave me a fine business experience; and, before I took my last degrees from Boston University and Harvard, I was getting a salary of five thousand dollars." "After taking my A.B. degree I entered Boston University School of Oratory and became treasurer and business manager of this department of the university. I was graduated from the School of Oratory in 1879, and in the same year took the university's A.M. degree." "The golden opportunity you are seeking is in yourself. It is not in your environment, it is not in luck or chance, or the help of others; it is in yourself alone." "I next entered the fourth year postgraduate class at Harvard Medical School, where I profited greatly under the genial lectures of Oliver Wendell Holmes, Professor of Anatomy. Before I left the university I began to enlarge the Littlefield Hotel, which I had bought and renamed the Manisses, completing the addition the next year, — the hotel and cottages costing some thirty thousand dollars." These notes omit the fact that he was given two additional degrees by Boston University — B.S. and B.O. He was graduated with honors from its School of Oratory, and, had he so desired, he could have remained in the university as Professor of Elocution. "Orison Swett Marden deserves a prominent place in this history. Of all the resorts for which this county of Newport is justly famed, none is more popular than Block Island, 'the gem of the sea'; and to Doctor Marden more than to any other one man is due the credit of discovering the superiority of Block Island as a summer resort. Though not the first to discover it, he was the first to see its great possibilities. He found it occupied in summer by a mere handful of guests, not a first-class hotel on the whole island, and only a few houses that took boarders at all; his farsighted wisdom, and wise and judicious advertising have made it the resort of as fine a class of people as can be found at any resort in the country. Whatever else Doctor Marden is distinguished for, or shall be, he will be remembered with gratitude by thousands who have through him found rest, and health, and relaxation in the almost matchless atmosphere of this seaside isle." "He went to the island in 1877 as clerk of the Ocean View Hotel, at that time scarcely larger than a country tavern. It was not long before the astute owner, Nicholas Ball, discovered the ability of his new clerk and made him manager of the house. The new manager had already discovered the possibilities of this wonderful island, and began at once that system of advertising which has brought it to the notice of the wealthy and influential. Knowing also that it would be useless to attract the rich to the island if there were not suitable accommodations for them after they came, he began a systematic course of enlargement and careful attention to the quality of his accommodations. His policy has been surprisingly successful. Year by year, as business steadily increased, he enlarged his house until, in a few years, he had a strictly first-class hotel, capable of accommodating five hundred guests." "It is seldom that a man succeeds well in more than one line of effort. 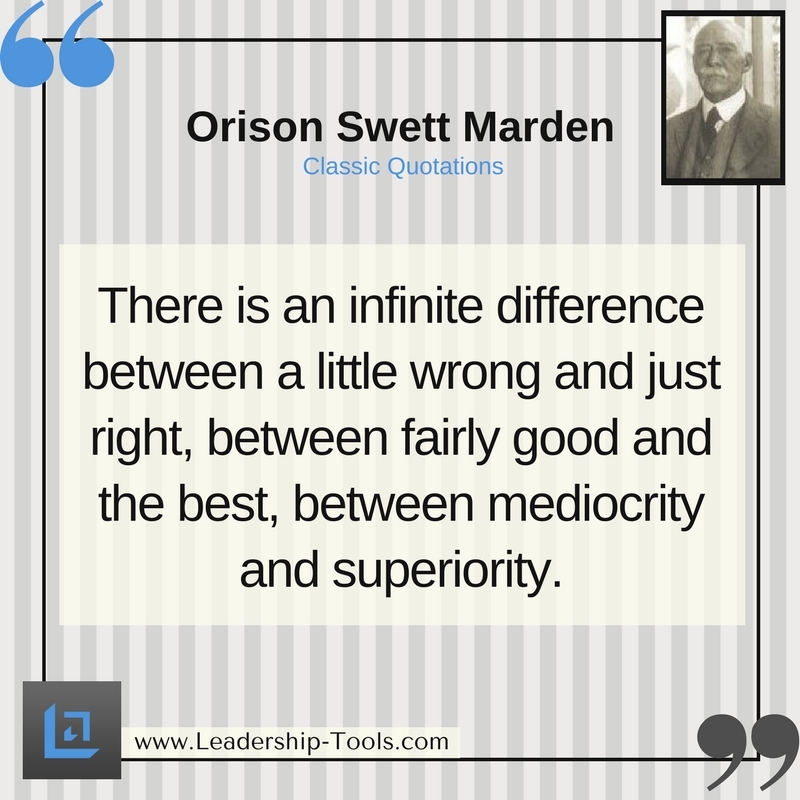 Doctor Marden has succeeded well in two very important lines. As a hotel manager he is the peer of any. It is not generally known by his hotel acquaintances, however, that, parallel with his successful labors in this direction, he has also carried on a remarkably successful and systematic course of study." To large abilities he adds a strong and healthy ambition, indomitable perseverance, and a will that never yields. Above his ambition to succeed in his work of ministering to the wants of the weary 'summerer,' and above his thirst for knowledge, Doctor Marden has a fine ambition to be useful to the world. All his labor is means to this end. It is not surprising, therefore, that, during all these years, he has been painstakingly pursuing course after course of study, during the months while his hotel work has not taken all his time. It is a proof not only of the ability, but also of the energy of his character, that he could do so much educational work at the same time that he was doing, and doing so well, the work of developing Block Island." "A visitor to the island would not know it as the quiet, dull, uninteresting place of ten years ago. On every hand have sprung up fine hotels and beautiful cottages; distinguished strangers from all over the land flock hither to enjoy the balmy air and magnificent ocean scenery; business has increased many-fold; real estate has advanced greatly, and still increases in value. For this great prosperity Block Island and its inhabitants are largely indebted to the wisdom and enterprise of Doctor Marden; and it is pleasant to record that they appreciate this fact to a large extent." "He has also himself prospered with the prosperity of the island; is owner of the Hotel Manisses, one of the finest of the island hotels; also of quite a large amount of real estate, and is the trustee of several land syndicates. He is also treasurer of the Fort George Island Company in Florida." 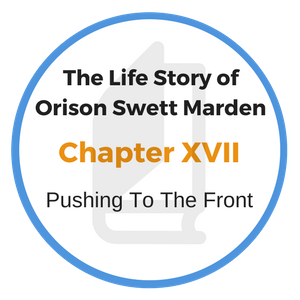 "Doctor Marden's career thus far gives promise of an enviable future. Clear-headed, farsighted, careful, painstaking, laborious, with large and honorable ambition, dauntless courage, tireless energy and invincible will, he is also a conscientious, unselfish, cultured Christian gentleman. Such qualities will always enrich not only their possessor, but also the world." This "History of Newport" was written when Doctor Marden was at the beginning of his great financial successes, before he had cut loose from everything else and entered on what he made his real life work. "We lift ourselves by our thought. We climb upon our vision of ourselves. If you want to enlarge your life, you must first enlarge your thought of it and of yourself. Hold the ideal of yourself as you long to be, always everywhere." While going through school and college he had been a Benjamin Franklin of thrift in regard to both time and money. It was said of him that no poor student had ever entered college with so little money and left with so much. During his college years in Boston he had become so expert in the catering and hotel business that he had saved nearly twenty thousand dollars. Every cent of this had been earned by steady hard work, and it was that which; enabled him to start on a career of financial independence, beginning with the enlargement of the Manisses Hotel. His savings also enabled him to round out his college successes by a period of travel and further study in Europe. Always seeking more knowledge and experience, he had long had this in mind, and in 1882 he sailed for Europe. There he visited France, Germany, Italy, Austria, Hungary, Great Britain and Ireland. "I spent a great deal of time in Italy, and especially in Rome, studying Roman history, of which I was extremely fond. I was taken ill with Roman fever in Naples, while going up Mt. Vesuvius. This is almost the worst form of typhoid, with malarial fever superimposed. I was taken back to Rome, but grew rapidly worse." "Friends took me to Florence, where I lay ill in a hotel nearly all winter. As only one person in the hotel could speak a word of English, it was not the most delightful place in the world to be sick in." "Even with the best physicians in Italy attending me, sometimes two or three a day, my recovery was considered extremely doubtful. In fact, the best physician in the kingdom said I had but one chance in a thousand. I decided to take that chance and so lived to tell the story." I was kept in a dark room for a long time in Florence, on account of my eyes, the sight of which I came very near losing entirely. I managed, however, to visit Venice, Vienna, Paris, Berlin, Dresden, and a considerable part of Austria-Hungary, Ireland, Scotland, and England." On his recovery he returned to America and continued in the hotel business for ten years longer. 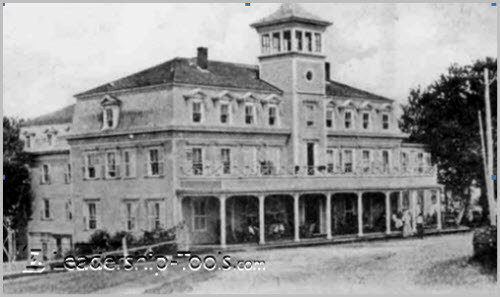 While retaining his own hotel, the Manisses, at Block Island, after he resigned the management of the Ocean View Hotel, he also became proprietor and manager of several other leading hotels in different parts of the country. But in spite of his many duties, he always managed to get some time to write. During all these strenuous years, while working his way through school and college and in his crowded business life, he had never forgotten or neglected the "dream book" of his boyhood. Never a day passed that he did not add something to it, if but a paragraph or a few lines. In fact, he gave most of his evenings, and every spare moment, to his literary work. 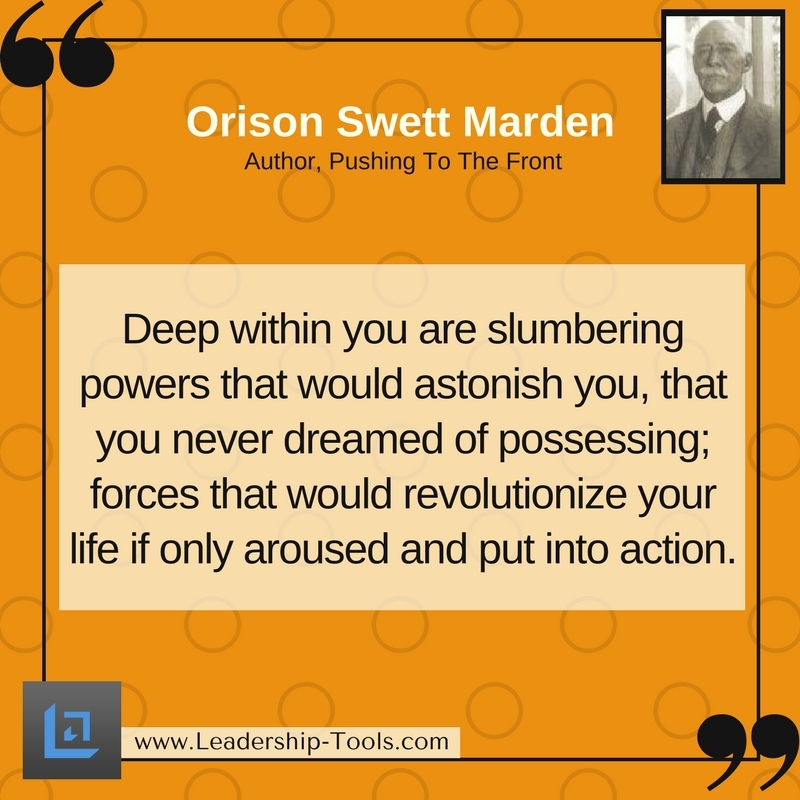 In addition to the "dream book," which became "Pushing to the Front," he had started, while in college, the manuscripts of some other inspirational books. In preparing these manuscripts he had no thought of money or fame. "Doctor Marden has a fine ambition to be useful to the world. All his labor is means to this end." His object was wholly altruistic, his hope being that, some day, they might be published and, perhaps, be "an inspiration and help to strugglers who were trying to become somebody and do something in the world" — that they might encourage and hearten others as Smiles's "Self Help" and the "Getting On in the World" of Mathews had encouraged and heartened him when he was struggling to get an education and find his place in life. While he was more and more justifying his nickname of "Lucky Marden," and wealth had begun to flow in upon him, there were at work in the subconscious strata of his mind two opposing ideas. He was not, perhaps, fully conscious at the time of the struggle between the ideal and the practical, the business and the literary side of his nature. Nevertheless, it was there. The great game of business was exciting and interesting, especially when one success followed another and stimulated to the pursuit of new enterprises and the capture of larger rewards. But the literary urge, the increasing desire for self-expression in a new field, was daily gaining strength. "There is a divinity that shapes our end."